Saturday April 18 1908 I did sweeping and baking and got the dinner Will was down to Woolfs in the forenoon and to town at 12.12. I went down there in afternoon. Will keeps about the same and Mary is not well. It was late when we had supper I read a little and went to bed. Sunday April 19 1908 A regular summer day. Will and I went to church I got the idnner after we came home and read and wrote in afternoon. Monday April 20 1908 It was still warm. I was busy all forenoon with the work. I had dinner so I went down town at 1.12. Was at Dr Smiths office did trading coming home at 4.39. 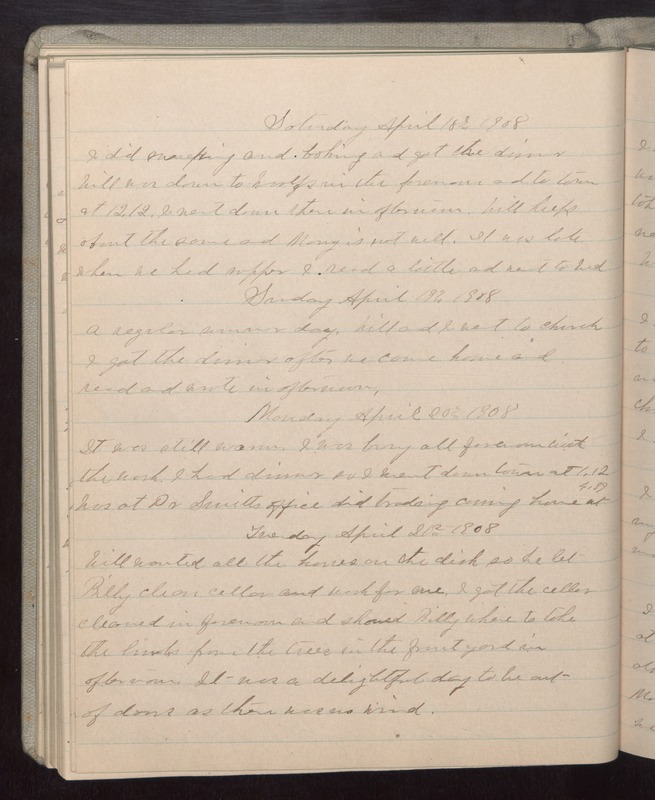 Tuesday April 20 1908 Will wanted all the [horses?] on the dish so he let Billy clean cellar and wash for me. I got the cellar cleaned in forenoon and showed Billy where to take the limbs from the trees in the front yard in afternoon. It was a delightful day to be out of doors as the was no wind.